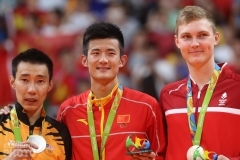 Fu Haifeng and his team-mates made a first step towards final victory in the ongoing China Badminton League, which started two months ago and deprived all top Chinese shuttlers from international competition. After beating his usual partner Cai Yun in the semi-finals, his team of Qingdao beat Hunan 3-2 in the first leg of the final. The semi-finals of the league was an exciting showdown last week, which saw some of the top Chinese stars leave the competition. Lin Dan (photo), with his People’s Liberation Army were beaten by Bao Chunlai’s Hunan team. 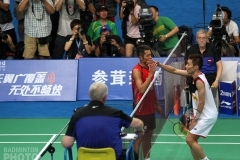 The first leg of the final of the Chinese Badminton Super League was held on Thursday in Hunan. 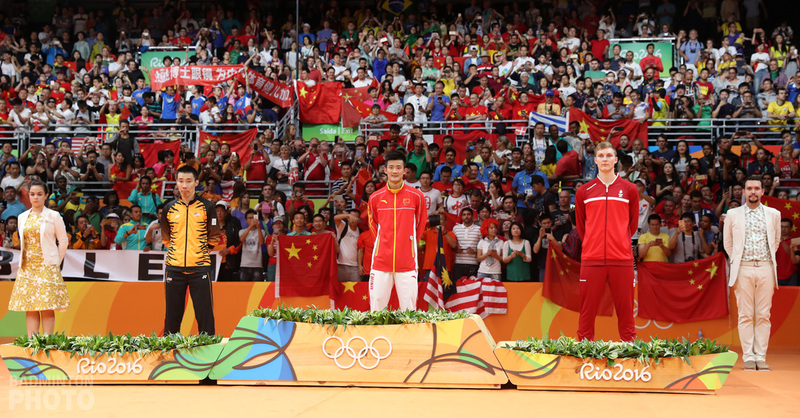 In spite of the exciting set-up, many Hunan badminton fans were quite disappointed as Bao Chunlai was not fielded, which was bad news for the locals as he was, on paper, a far better player than Zhou Wenlong who represents Qingdao. On the other hand, Qingdao was also missing a key player in the name of Du Jing after the latter had injured herself. She usually paired with Ma Jin in the women’s doubles. Instead, Qingdao sent the twin sisters Luo Ying / Luo Yu to play for the women’s doubles. The first match of the final saw Hunan’s Zheng Bo and Tian Qing take on Shen Ye and Ma Jin. A 50-50 match, but at last, the more experienced Zheng Bo / Tian Qing prevailed by defeating Shen Ye / Ma Jin 21-16, 15-21, 21-14 to give Hunan an early advantage. Zhou Wenlong then put things back to square one, enjoying Bao’s absence to defeat Hunan’s Zhang Sheng 21-17, 25-23. The third match of the final was women’s doubles. An easy match on paper for Hunan’s Tian Qing and Xia Huan, one of the top women’s doubles pairs in the Chinese Badminton Super League. 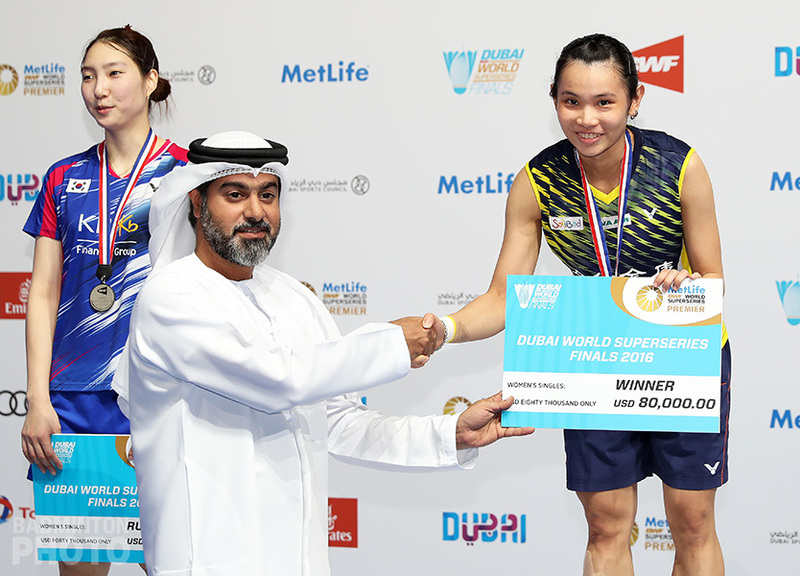 Xia Huan, the former World Junior Champion, using this Chinese Super Badminton League as a training ground, has improved tremendously. With just half an hour of playing, Tian Qing / Xia Huan defeated Luo Ying / Luo Yu 21-15, 21-18 giving Hunan the lead, one point away from victory. Qingdao however counted on Wang Xin to crawl back into the tie, as the latter was facing the former Asian Junior Champion, Chen Xiaojia. Wang Xin is a better player overall but when they met during the regular season, in the round robin stage, Chen Xiaojia had nearly forced Wang Xin to play a rubber game. 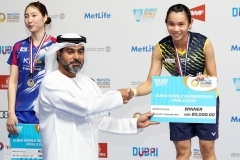 Hence, Wang Xin was aware she would have to play her best and she did, demolishing Chen Xiaojia 21-9, 21-14, letting the men’s double decide for the final win of the day. 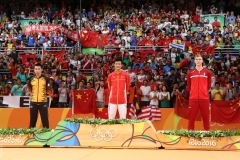 On one side of the court, Hunan was represented by Zheng Bo / Chai Biao whilst Qingdao is represented by Fu Haifeng / Shen Ye. Fu Haifeng and Shen Ye are the top two men doubles players in the league, in which Shen Ye is ranked first and Fu Haifeng is ranked second. The latter took an 11-8 lead into the interval of the first game, then, Zheng/Chai caught back to lead 17-15. But, Fu/Shen pushed ahead and took the opening game 21-19. In the second game, Fu and Shen were leading 9-6, but Zheng/Chai kept fighting to get back at 11-10. After the interval, Zheng/Chai kept on leading with a two point gaps before forcing a rubber game by winning the second game 21-19. The score was so tight at the beginning of the rubber game. Nevertheless, after 5-5, Fu/Shen were supremely confident of victory after taking a stunning 11-5 lead before nailing it 21-12. As a result, Qingdao completed the 3-2 rout as they won the first final of the league. The second final will be held in Qingdao this coming Sunday. If Qingdao wins the second final, they will become Champion of the first Chinese Badminton Super League. But, if Hunan wins, a rubber tie will be played on Monday to decide the ultimate winner.